Honda CB Hornet 160R is a naked streetfighter from one of the most selling manufacturers. The company has updated the vehicle with the single channel ABS feature as a 2018 Calendar year update with other changes bits like, LED headlamp, striking graphic and a bold monogram on the chiselled fuel tank. In addition to this, the instrument console has also been improved for blue illumination instead of amber seen earlier though the gear position indicator lacks. 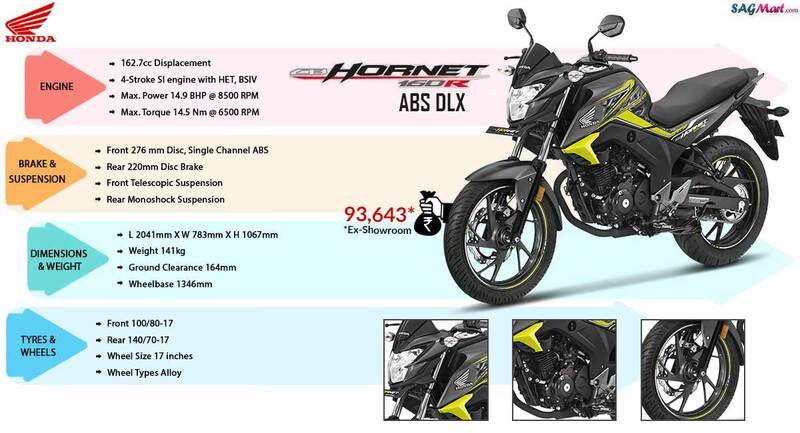 It priced at INR 92,675 (Ex-Delhi) and rival against Yamaha FZ-S FI, Bajaj Pulsar NS 160 and the new TVS Apache RTR 160 4V.